Wow. Just when it seemed that Paramount pretty much had the lock on a distribution deal for all the in-house superhero movies made by Marvel Entertainment, Disney swoops in and buys Marvel whole hog, to the tune of $4 billion. 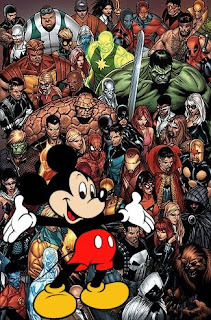 "Disney is the perfect home for Marvel's fantastic library of characters given its proven ability to expand content creation and licensing businesses. This is an unparalleled opportunity for Marvel to build upon its vibrant brand and character properties by accessing Disney's tremendous global organization and infrastructure around the world." In other words, just in case you were wondering, this is all about money. Disney has the better action figure manufacturing companies, apparently. I have no idea what this means for the approximately 800 Marvel movies currently in development-- I had just assumed they would all be Paramount films, but I'm not sure how many of them Paramount actually has signed deals for. There's also the question of what it means for the characters themselves, given how beloved Disney figures like Cinderella or Simba have been put through the wringer thanks to direct-to-DVD sequels and toys that should embarrass anyone. No matter what happens, it likely means big changes for all fans of the Marvel movies, and even more comic book overload in an already crowded market. We'll be holding our breath to see how this turns out. UPDATE: Over at CHUD, Devin Faraci is on a conference call with the Disney-Marvel folks getting some key updates, such as the fact that current Marvel distribution deals will stay in place (Spider-Man stays at Sony, Iron Man at Paramount) until they expire, AND John Lasseter has met with the Marvel folks. Expect some crazy Pixar/Marvel hybrids that might make this whole deal worth it alone.